With our self-managed conference call services, you and your teams can securely and easily communicate with colleagues, customers and others around the world. Our services are ultra-reliable, easy to set up and manage, and give you complete control. Instantly invite participants via calendar invite, email or text. Participants simply call the number and enter the pin provided. 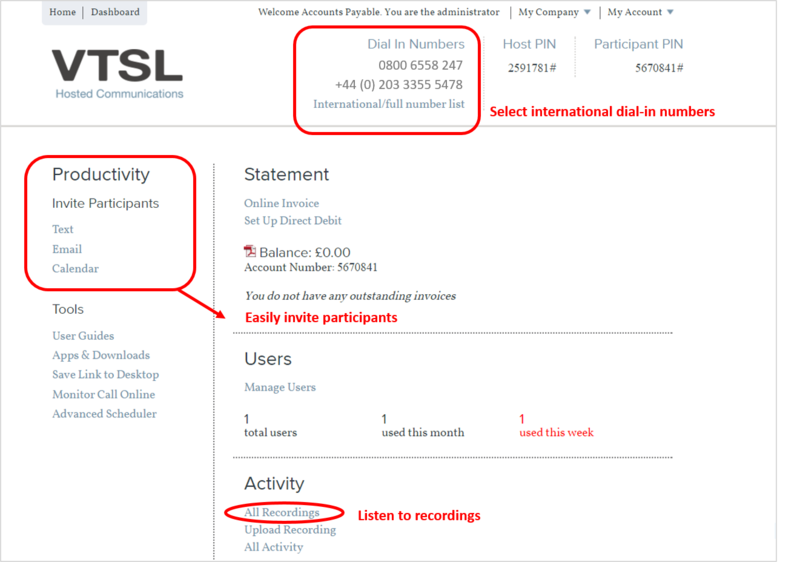 As host you can provide a local dial-in number for any country should your participants be abroad. VTSL offers one of the most affordable conference call services available. There is no fee to sign up, you just pay a low rate determined by the dial-in number. Gain from a wide number of local and toll-free numbers for you and your participants. It is easy to record your meeting and then listen, download or share it. Users can stream the recording online, dial-in using a PIN, or you can choose to have the recording transcribed. Integrate your conferencing services with Outlook to automatically add your conference details to an email or calendar invite. Manage your account and live conference calls online from our online portal. All employees that are permitted to use the service are added by the Administrator. Below is a sample Administrator's dashboard.